Definition: The Capital Budgeting is one of the crucial decisions of the financial management that relates to the selection of investments and course of actions that will yield returns in the future over the lifetime of the project. Identification of Potential Investment Opportunities: The first step in the capital budgeting process is to explore the investment opportunities. There is generally a committee that identifies the expected sales from a certain course of action, and then the investment opportunities are identified keeping these targets as a basis.Before initiating the search for the potential investments, there are certain points that need to be taken care of: monitor the external environment on a regular basis to know about the new investment opportunities, define the corporate strategy based on the analysis of the firm’s strengths, weaknesses, opportunities and threats, share the corporate strategy and objectives with the members of capital budgeting process and seek suggestions from the employees. Assembling of Investment Proposals: Once the investment opportunities are identified, several proposals are submitted by different departments. 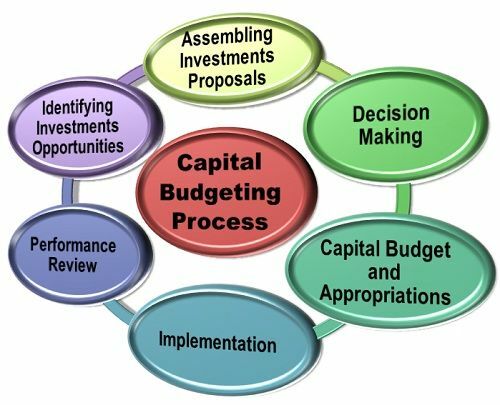 Before reaching the capital budgeting process committee, the proposals are routed through several persons who ensures that the proposals are in line with the requirements and then classify these according to their categories Viz, Replacement, Expansion, New product and Obligatory & welfare investments.This categorization is done to simplify the task of committee members and facilitate quick decision making, budgeting, and control. Decision Making: At this stage, the executives decide on the investment opportunity on the basis of the monetary power, each has with respect to the sanction of an investment proposal.For example, in a company, a plant superintendent, work manager, and the managing director may okay the investment outlays up to the limit of 15,00,000, and if the outlay exceeds beyond the limits of the lower level management, then the approval of the board of directors is required. Preparation of Capital Budget and Appropriations: The next step in the capital budgeting process is to classify the investment outlays into the smaller value and the higher value. The smaller value investments okayed by, the lower level management, are covered by the blanket appropriations for the speedy actions.And if the value of an investment outlay is higher then it is included in the capital budget after the necessary approvals. The purpose of these appropriations is to evaluate the performance of the investments at the time of the implementation. Implementation: Finally, the investment proposal is put into a concrete project. This may be time-consuming and may encounter several problems at the time of implementation.For expeditious processing, the capital budgeting process committee must ensure that the project has been formulated and the homework in terms of preliminary studies and comprehensive formulation of the project is done beforehand. Performance Review: Once the project has been implemented the next step is to compare the actual performance against the projected performance. The ideal time to compare the performance of the project is when its operations are stabilized.Through a review, the committee comes to know about the following: how realistic were the assumptions, was the decision making efficient, what were the judgmental biases and were the desires of the project sponsors fulfilled. Thus, the Capital Budgeting, due to its complex behavior comprises a series of steps that should be strictly followed before finalizing the investments.